Storm The Stars gave his St Leger hopes a major boost after grinding out a slender victory in a dramatic race. The ante-post favourite for the final Classic of the season at Doncaster next month repelled the late thrust of Bondi Beach to get the better of a rousing finish to the mile-and-a-half Group Two prize. Racing just in behind the early pace set by Medrano, the Investec Derby third moved into the lead on the run down to the final two furlongs. Although in control, it looked as though the William Haggas-trained colt was to be a sitting duck for the strong-travelling pair of Tashaar and Bondi Beach. As the former saw his run come to an end when asked the question, it was left to the 3-1 winner and Aidan O'Brien's 11-4 favourite to battle it out. Despite drifting across the track, Storm The Stars showed just what a tough character he is by digging deep to pull out victory by half a length and while a stewards' inquiry was immediately called, the placings remained unaltered. Winning rider Pat Cosgrave said: "I popped out to make the running, then the other horse (Medrano) took me on so I let him get on with it. I just did my own thing. To be fair, he's tough and has battled for it, but he wanted it more than the second horse. "He's very excitable, that's why he's run so many times. You can't keep on top of him at home. He just wants to race. I think there will be improvement from today." Haggas said: "He's tough. I'm delighted with my horse. He's a very tough, hardy resilient horse and they often lug to the left on this track as the bend turns into the left - it's like Windsor in that respect. "He's tough and hardy, has done extremely well and bounced back very well so that should put him spot on (for the St Leger), not so much physically as mentally. "He got a bit sweaty today, he's been off for a bit, but he's just hard horse." In the live televised inquiry on Channel 4, Cosgrave admitted his horse had given Bondi Beach "a bump" but was adamant he was "going away at the end and the best horse won". Joseph O'Brien in contrast, felt the bump "had cost him the race" on Bondi Beach. RaceBets cut Storm The Stars to 7-2 favourite from 5-1 for Doncaster on September 12, with Bondi Beach an 11-2 chance (from 12-1). Assessing his Doncaster chance, Haggas said: "It's three and a half weeks to the Leger now and whether he will stay the extra two furlongs, I don't know. He won't have to attack so early, though, which is one thing. It will be a different type of race, run at a different pace. "I knew beforehand that Aidan liked his a lot, so we will probably see a lot of him again. 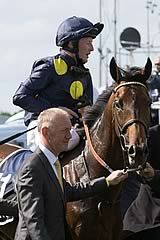 "Whatever happens in the Leger, he's had a fantastic year. He's done us proud and I think there's every chance he will stay in training next season. Put it this way, I'll be putting a padlock on the door!" Michael Tabor said of the Coolmore-owned runner-up: "He's run a good race. The Derby form is there for all to see. You would have to say he would be our number one Leger horse now." Connections of Tashaar were similarly pleased with his effort, although he is expected to go on to better things next term. Harry Herbert, racing manager for Sheikh Joaan Al Thani's Qatar Racing operation, said: "He's run really well and it was a very good effort. "Frankie just said his inexperience caught him out a bit, but also that he wasn't quite strong enough for a race such as that. At one stage he thought he was going to be very involved in the finish, but he just got tired. "Next year it will be a different story and he will probably only have one more run this season."